Synergy has a new electric car in our fleet, and I am the lucky one who is the primary recipient. We have been thinking about getting an electric vehicle (EV) now for a few years, but kept putting it off, thinking the technology would continue to change and thought it best to wait. I have been driving a Jetta TDI which was getting over 40 mpg, a very economical car. My lucky daughter will be getting this great car. I did not want a pure hybrid that got 50 MPG. I was already getting close to this with my Jetta TDI, and I wanted a plug-in. So the first thing I needed to look at was our business goals, budget and my driving habits. Our business goals include buying local, and primarily American made products. My driving habits average about 30-40 miles per day, but the range can be between 0-120. During my busy days, I did not want to have to budget in the time and logistics of having to find a charging station or the time to charge. This eliminated most of the low to mid-range pure electric cars which have a limited range of around 80 miles. On the higher range, the BMW, Cadillac and Tesla which can go about 200 miles on a charge, would have worked, but these cars were out of my budget. I looked at what was left. There were only a couple of options, the plug-in Prius, and the Chevy Volt. The Prius on got 11 miles on a charge to the Volts 38 before the gas engine kicked in, and the Volt is American made. That sealed the deal. 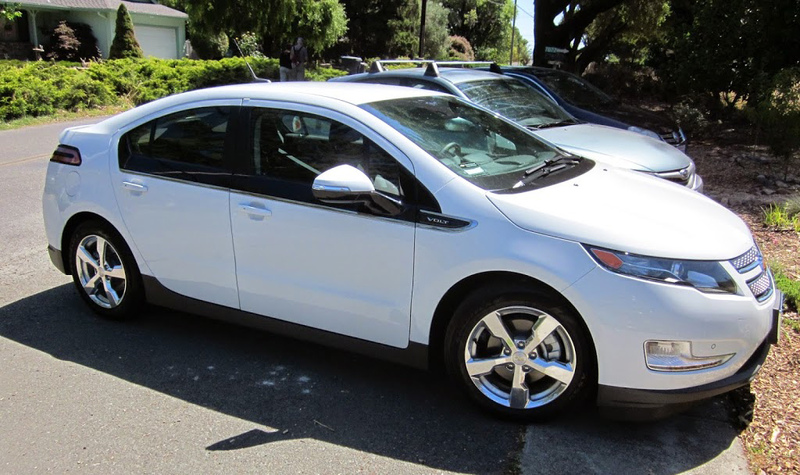 From a personal perspective, I liked the look of the Volt better, and it is a blast to drive. The 38 mile electric range will be enough to cover my average days, and the gas generator back-up will allow me to deal with the heavy driving days without the extra worries about needing to charge. The financials: I got the car out the door with taxes, CRV and license for a little over $38K. In addition to this, our company will be getting a $7,500 federal Tax credit and a $1,500 state tax credit, which brings the actual cost to about $29,000. These credits are not around for long, so it seemed like a good time to purchase. I explain how I cover fuel costs in the following paragraph. I will be using solar to power my Volt. Some of my favorite features are that it has more bells and whistles then I know what to do with. The syncing to my iPhone was quick and easy, the navigate system is slick, and the general feel of the seats and dashboard are comfortable. By far, my favorite feature allows me to charge at off-peak rates. I set my schedule of usual departure times in the morning, and the computer figures out the time it needs to begin the charge to fill it up. If I need it right now, I can easily override this function. Like all new technologies there are a few things I am not used to yet. The Volt does not have a spare tire, but comes with a compressor to fill slow leaks. I guess the On-star system will take car of any major blowouts. While I have not needed a spare in many years, I still need to get use to this. The 110 volt charger provided is doing the job and made it easy to just bring it home and plug it in. I will be adding a 240 volt EV charging station in the coming months which will improve the efficiency and quicken the charge. And while I have been running my home on solar for the past 6 years, it was sized to cover my home and rental. I already have 8 additional solar panels installed in order to cover the new load of the electric car. This new system will provide me with about 10 kWh of additional energy per day, my estimate of the Volts use, for the next 25-30 years. That equates to about $320 per year, or $26 dollars per month to drive 1,000 miles on sunshine. To put this in perspective, a 30 MPG car, would cost $133 per month with gas at $4.00 a gallon. And the icing on the cake, in 25 years my cost will still be $26 per month and the cost of gas? Another option I am exploring is PG&E does offer a special EV rate schedule. I am not sure if this schedule will be better than my current E6 time of use schedule. I have spoken above about the facts and figures of buying an EV, but I am half owner for a company where our goal is to make the world more sustainable. I have spent tens of thousands of dollars lowering the carbon footprint of my home. The new Volt allows me to carry this philosophy into the vehicle I drive, that is to say, to put my money where my diesel was. Well that is all for now. Need to make another sales call, and I will be getting there driving on sunshine!